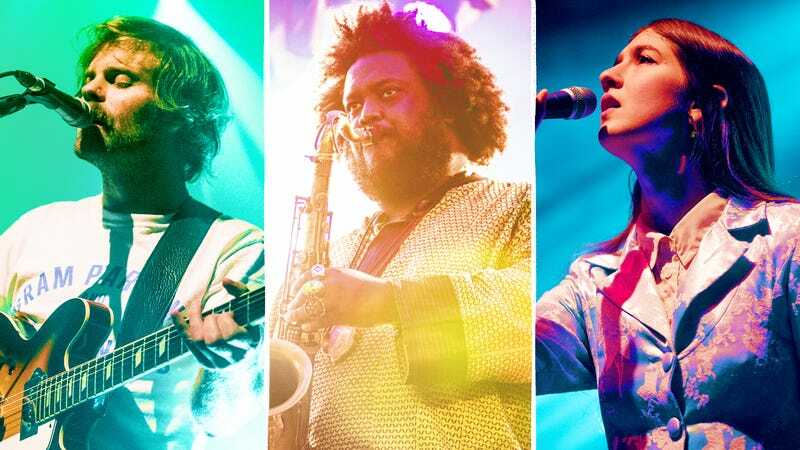 Neil Halstead of Slowdive (Photo: Gaelle Beri/Redferns via Getty Images); Kamasi Washington (Photo: Valeria Magri/Pacific Press/LightRocket via Getty Images); and Natalie Mering, a.k.a. Weyes Blood (Photo: Jordi Vidal/Redferns via Getty Images). Graphic: Natalie Peeples. Here in the dead of winter, the last thing on most Chicagoans’ minds is “music festival.” But in a city already saturated with summer concerts, and boasting a notoriously long cold, gray season, it was a brilliant move by Pitchfork and The Art Institute Of Chicago to organize Midwinter, a three-day event bringing music to the museum’s galleries this weekend, while the temps hold strong below freezing. With its limited ticket sales and emphasis on multi-sensory experience, it seems like Midwinter will, unlike most festivals, be a great place to actually hear music. There’s pretty much no set we don’t want to see: The lineup is stacked with diverse artists like Kamasi Washington, Deerhunter, Jlin, Yves Tumor, Laurie Anderson, Oneohtrix Point Never, and Joey Purp. Here are 11 we’re prioritizing when things kick off this Friday evening. Friday, 10:15-10:45 p.m.; Saturday, 8:20-8:45 p.m.; Sunday, 6:45-7:15 p.m.